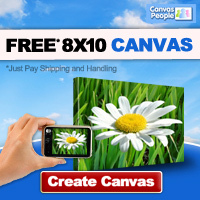 Just pay shipping on a Free Photo canvas - Go to the Canvas People Website to get your FREE 8x10 Canvas Print of any photo OR $50 Credit Towards Any Size Canvas! That's an awesome deal. The only thing you have to pay is shipping, which is around $14.95. This is a nice weekend project to put together that Graduation picture or nice Mother's day or Father's Day shot.